So in this one I'm going to talk a little bit about how dynamic linking works. 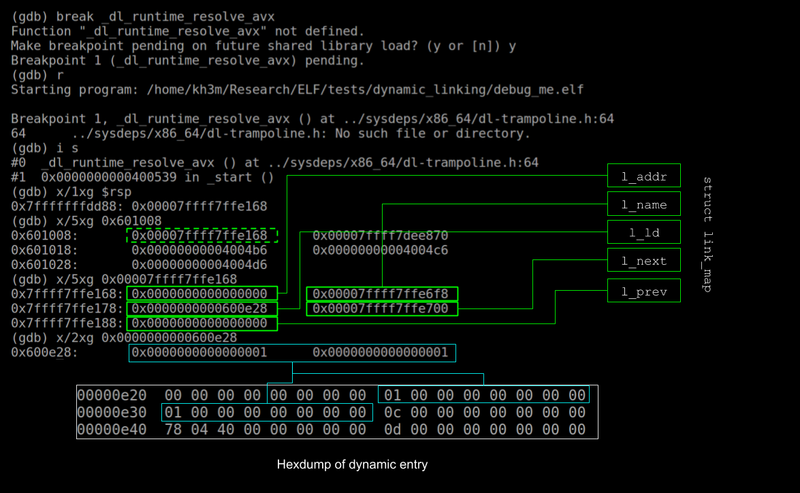 I'll unpack some useful things to know about how functions are executed when dynamic linking/loading is in effect. The Procedure Linkage Table (PLT) (its actually more like a list of code stubs) is a rough landing area for function calls to hit as a first stop in their dynamic linking journey. The PLT either branches directly to the function definition it needs (by referencing the relevant entry in the Global Offset Table) or sets up a call to the run time to sort it out (along with some other parameters we will see later on!). A better name would be something like a "Procedure linkage function chain" because its actually just a contiguous region of code with a little run time invoking stub at its "head". The Global Offset Table (GOT) holds values that are meant to point directly to the intended definition - its essentially the "final destination" of a function call. As mentioned above this table is used as kind of a de-coupled reference table for the PLT. 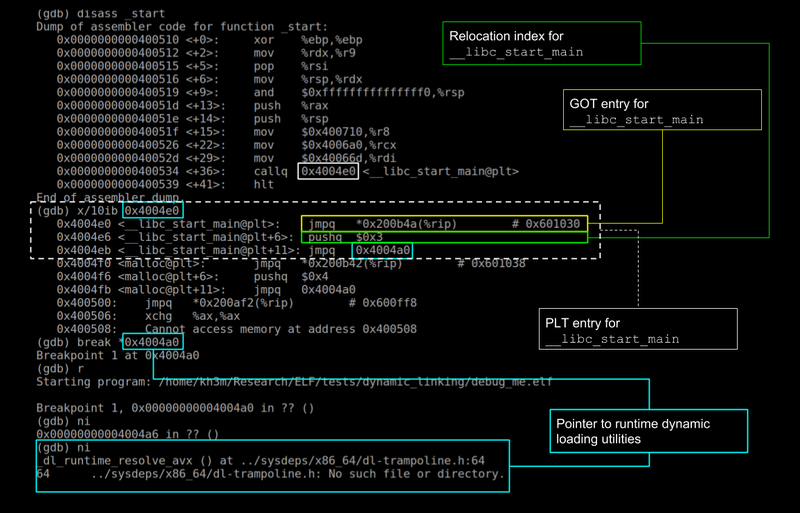 This is amazing for exploit deve-uh I mean compiler extension development; because it means if you can achieve simple address wide overwrites you can do a lot by targeting the GOT, in terms of possessing execution flow. The runtime's end goal is replacing the GOT entry for the called function with its correct value. The PLT entries that trigger when a function calls; preps some arguments the runtime needs to resolve the particular GOT entry. 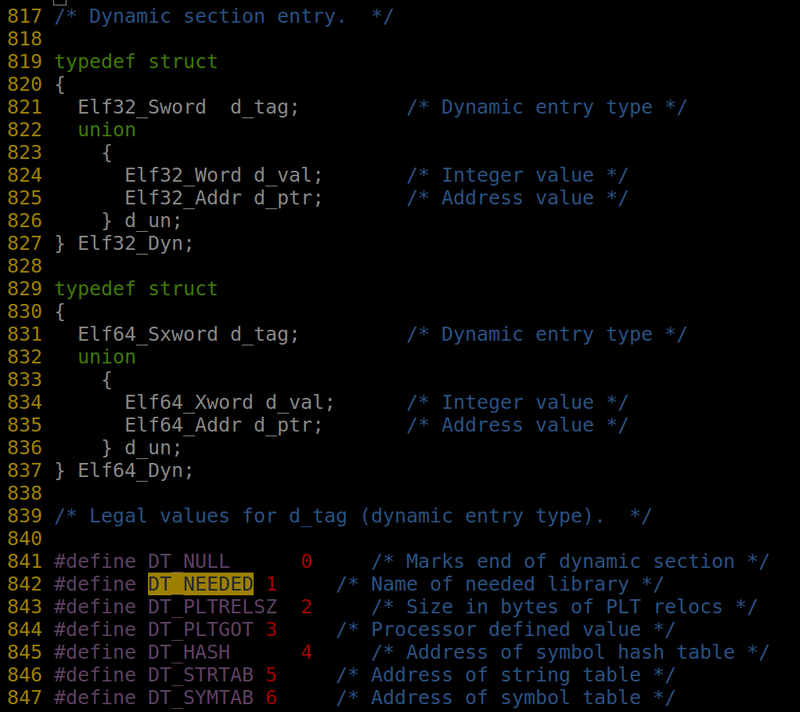 These arguments include the link_map for the given object and its index in the dynamic symbol table. So we're going to look at how each of these data-structures work and show simply where you can replace values to subvert execution flow (depending on how you achieve the write of course). The fields are pretty much documented well, as far as I can see they really do behave as described. There is one other field would like to expand on here namely the l_ld, this is the reference to the .dynamic section entry for this function. And as you guessed it means we will probably need to talk about how the .dynamic section works. Okay so that's the link_map and .dynamic section done we can move onto looking at what happens when a function is resolved and how this affects the GOT. To get functions resolved without preparing all the relocations up front, the ELF format and dynamic linker use a mechanism called lazy loading. Lazy loading essentially means resolving and patching up the GOT entries for a function when it is called. This is obviously so that subsequent function calls do not need to involve the dynamic linker / runtime (in a previous post i showed explicitly how the dynamic linker kicks in again if you mess with some other meta-data). Compare the GOT values before and after. 0x4004e0 jumping to 0x601030 the GOT entry for __libc_start_main. This is because when the linker is does lazy loading; the first instruction will hit the function directly if the GOT has been patched but upon first call this is always the next instruction after the jump - so its effectively a jump to the next position in the PLT. 0x4004e6 pushing a number onto the stack - this is the index of the relocation entry that applies to this action, the dynamic linker needs this to do its job. 0x4004e6 jumping to the head of the PLT which invokes the dynamic linker directly. The head contains some interesting code. We can see at instruction 0x4004a0 some value gets pushed onto the stack before it jump's off to the dl_runtime_resolve at instruction 0x4004a6. Whats happening here is the link_map for the object (libc.so, libsecurity etc etc) that holds the symbol involved in the lazy loading is being passed to the dl_runtime_resolve function as an argument. We can dissect this link_map through different calls to the dl_runtime_resolve to see that it is actually always the link_map object. Knowing that the link_map must contain a pointer into the dynamic section; so if we see dynamic section approximating values in the area round the pointer being passed to dl_runtime_resolve it is most likely a link_map object. 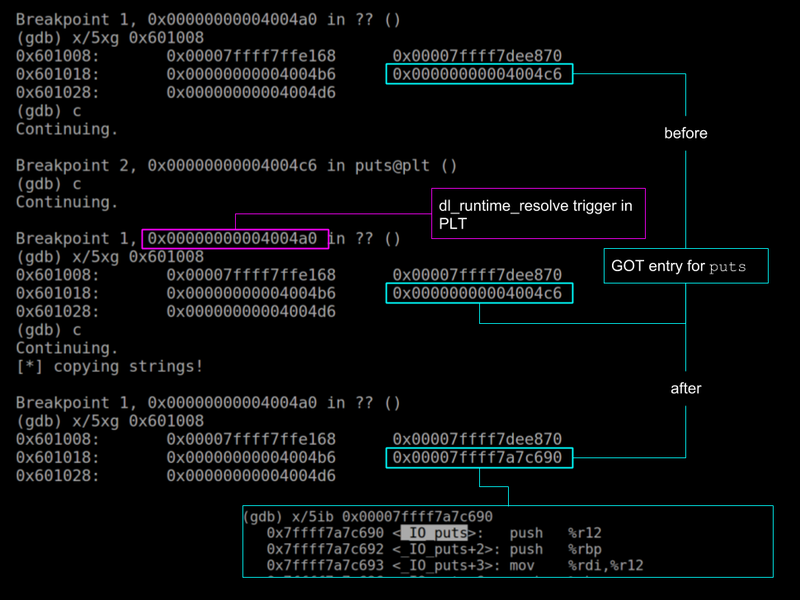 Or I should rather say: if it appears there whatever it is - dl_runtime_resolve will treat it like a link_map object. After the second break point at 0x4004a0 hits (which is the setup code for the call to dl_runtime_resolve) we can clearly see some new entry in the GOT at address 0x601020; the update adds the address 0x7ffff7a7c690 which we can see from symbol information in the debugger is the _IO_puts function! GOT entry correctly updated. Okay that's pretty much it for this post. In later posts I may talk a little about how to abuse this lazy loading mechanism to achieve execution of other functions - some cool tricks. For now I thought I'd keep it short and only explain some main concepts here and leave the advance sorcery and ELF black magic for future posts. Stay tuned folks! Some stuff I read and relied on to make this post. Very useful information here!